crop, resize, contrast. cloned out a green weed and white flower at top left corner of image, saturation, flatten, USM. The weed and flower were blurred with the use of F4 but still bright enough to be quite distracting against the otherwise black background that was just the ground cast in shade from the trees overhead of the enclosure. 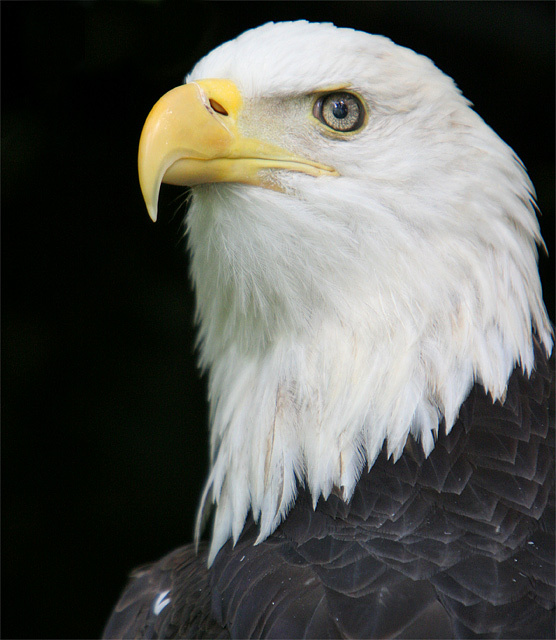 The glint of light in the eagle's eye really makes this image for me. He turned is head to just the right angle to where I was standing at the edge of the enclosure. Great closeup! This looks as if you shot it in a studio. Proudly hosted by Sargasso Networks. Current Server Time: 04/19/2019 01:05:34 PM EDT.